Gardening can be a rewarding, but sometimes confusing hobby. We’ve discussed before that the soil is the heart of the plant – it is where your plant gets all of its nutrients If you’re not very science savvy like me, the entire concept of acidic versus alkaline soil (pH level) can sound a bit overwhelming. I’ve learned, though, that testing your soil is not as intimidating as it sounds – it’s actually quite easy! 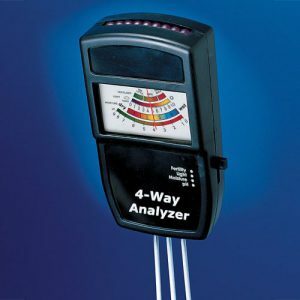 The 4-Way Soil Analyzer measures the pH level and so much more! The pH balance of soil will change by region, it can even be different from one side of your yard to the other! Some plants might enjoy a soil with a higher acidic content, but there are plants available that will do better in alkaline soil conditions. An example of a flower that is commonly effected by soil acidity is the hydrangea – blue hydrangeas are a result of soil with a high acidity level. Environmental factors such as rain, vegetation, and temperature can effect soil’s pH balance. The pacific Northwest region of the country more commonly has highly acidic soil due to its heavy rainfall. Whereas prairie and desert states may have more neutral soil sue to their drier climates. There are so many factors that can determine the levels of your soil – most of which you have no control over. Soil pH is measured by numbers. An easy way to test the pH of your soil is by using our Electronic 4-Way Soil Analyzer. It analyzes the levels of moisture, sunlight, fertility, and pH. It only takes a few seconds for it to measure these levels. Simply place the prongs into the soil near your plant and it will let you know what you need!This analyzer is so much more than your basic pH reader! 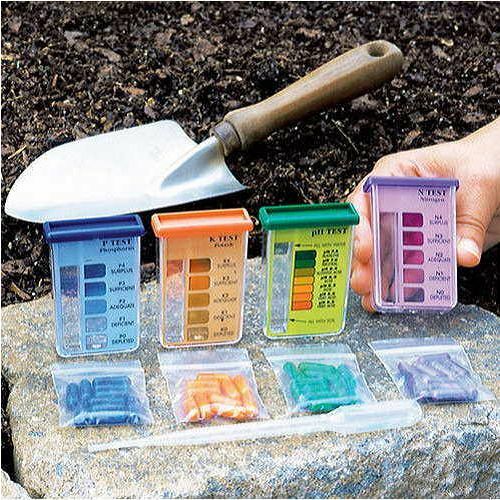 Our Soil Test Kit not only tests for the pH level – it also measures for other critical elemental levels of your soil! Soil testing can also be done before you plant your garden! It is a great idea to test the soil in the area where you plan to plant, so you can best prepare the soil. This Soil Test Kit can be used both pre- and post- planting. It will test the levels of Nitrogen, Phosphorous, Potash, and pH level. It is so easy to use, requiring only water and soil, and you will have your results in minutes. See, getting scientific in your garden can be easy – and fun! You will thank yourself for testing your soil – and your plants will thank you, too! Get out there and garden!